The approaching elections offer the prospect for a shakeup in the legislature that could lead to increased policy gridlock as Republicans and Democrats move further from compromise. One critical point under debate is the fate of the Bush-era tax cuts, which are set to expire at the end of this year. Republicans advocate the extension of all tax cuts, while the Obama administration seeks to extend the cuts for individuals earning less than $200,000 per year and families with incomes under $250,000. If the tax cuts expire without legislative action, the economy could face a significant setback. 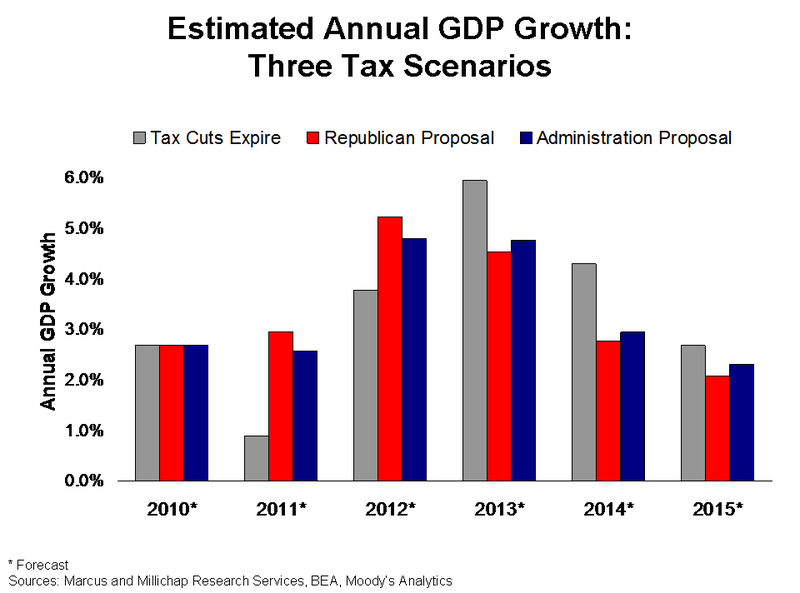 Current projections indicate the expiration of all tax cuts would virtually derail the recovery, reducing GDP growth to just 0.9 percent in 2011. Extending the tax cuts in full would lead to GDP expansion of approximately 3 percent next year, while the Obama plan would foster an estimated 2.6 percent GDP growth rate. Nearly all households would experience an immediate impact from the complete expiration of the Bush-era tax cuts, with higher taxes reducing take-home pay. The after-tax income of a married couple with two children earning slightly more than $75,000 per year, for instance, would shrink by approximately $220 per month. This could devastate the already fragile economic recovery, as personal consumption accounts for nearly 70 percent of GDP. Across-the-board reductions to net income could translate into the loss of 500,000 jobs in 2011, sending unemployment soaring to nearly 10.7 percent. Raising taxes for only upper-income households could also impede economic growth, as households in the top 5 percent income brackets account for approximately 37 percent of consumer outlays. Reduced consumption resulting from tax increases may hamper job creation in 2011 by roughly 300,000 positions, versus the renewal of tax cuts for all. Longer-term forecasts, however, show this plan would strengthen job gains in 2012 and beyond, as the short-term drain on the Federal budget would be less substantial. While raising taxes for even higher-income households increases economic risk, particularly as the recovery remains fragile through the near term, extending the tax cuts indefinitely also creates challenges. Current estimates place the cost of extending all Bush-era tax provisions at approximately $320 billion for fiscal years 2011 and 2012 combined and over $2.5 trillion through 2020. Given the extraordinary measures taken to battle the Great Recession, increased taxes may be required to cover the substantial expenditures. Raising taxes too much or too soon, however, could jeopardize the recovery. If the tax cuts expire without any intervention, the potential for another round of significant job losses would endanger the nascent recovery in apartment performance. At the same time, vacancy in the office and retail sectors would weaken throughout 2011 as demand ebbs. Assuming either the Republican or Obama tax proposals passes, or legislators reach a compromise, apartment vacancy should continue to strengthen next year to the upper-5 percent range, while retail vacancies would stabilize near 10 percent. This entry was written by marcusmillichap, posted on October 30, 2010 at 1:06 am, filed under Research and tagged Midterm Elections Stall Tax Cut Debate. Bookmark the permalink. Follow any comments here with the RSS feed for this post. Trackbacks are closed, but you can post a comment.